Christmas this year was exactly what I needed. We headed out to Rossland to spend the week with Frank’s family – longer than we’ve ever stayed out there. I asked for an absolute ton of reference books for Christmas – I feel like I go through bouts of enjoying fiction but then shift into learning more about illustration or my other passion – life hacking. Sounds like an odd category, but I have loved spending hours learning about creativity, finding your purpose, financial independence, minimalism, all of it. I keep waiting for the day I want to explore religion further but it hasn’t happened yet. I’m okay with it. Everything in life in due time, no? A little heavy for a blog post. The lead in was really just to say in between reading new books, sleeping, trying SNOWBOARDING (loved it!) and yoga, I got out a few times to sketch on site. Once in a coffee shop to gain some insight into people practice, and once to draw buildings. 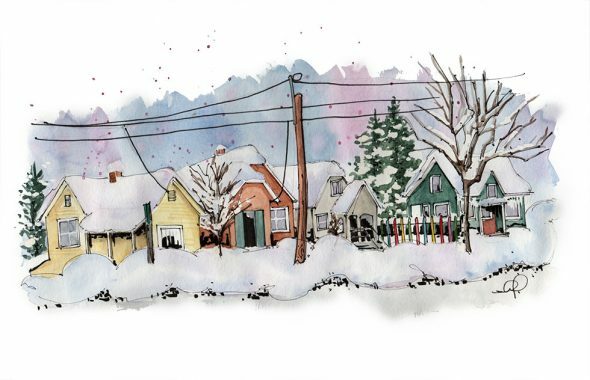 Shari Blaukopf writes a lot about her car studio for winters in Montreal. I’ve let winter be a hindrance before. I did start sketching a little more on site last year, and it was a learning curve to be sure. At first I was so nervous I would completely drop scale, then once I got over that I would overthink things. I also had to get over feeling self conscious. Then once it got cold it was the perfect excuse to stop…wasn’t it? But the truth is, the more you do it, the more you want to. There’s an unexplainable rush that comes from sketching on site once you get past that initial curve. There are two cars in this image buried completely under snow. 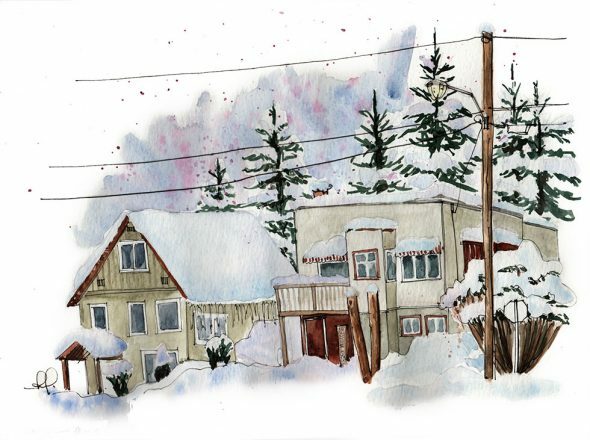 This first sketch was done from the car in Rossland. Frank and his family left a few minutes behind me, I went out on my own, pulled over at the first thing to catch my eye and I started sketching. I know Shari has said she prefers to sit in the drivers seat with her paints and equipment in the cup holder at her right hand. I’m left handed but found the first hump for me was actually trying to angle my sketchbook around the steering wheel. It was uncomfortable – so instead I moved to the passenger seat. Things went much more smoothly there, but I also found I was cold enough that I stopped at the base sketch, retreating to the warmth of the house to do later ink and watercolour. The unexpected upside of this exercise though, is that it made me look more at all of my surroundings. Things you’d normally dismiss or even find unattractive are suddenly calling to you. A view down the road that you once would have said was way too much is all the sudden so appealing. There’s a quote about this. This painting was my favourite. I did have to do it from a reference photo – it was the day we headed back to Calgary. We stopped in at a friends house to drop off a package and I was sitting in the passenger seat of a very packed car, staring at the road in front of me. It was magical. The photo I took, when I went back to look two days later, was not. But I could remember that feeling from before, and so I persevered. I was really happy with the result. my reference photo. slightly less magic, no? And here’s my last bout of sketches from the trip. To be honest this was from a mashup of photos I took of houses around Rossland. Frank asked me once what I was looking for that would draw me to a house and I couldn’t give him a definitive answer. I just know when I see it. What I DO love about Rossland is that the houses are not uniform – there’s so much variety, clearly no architectural controls, and a lot of stuff is built into the side of the mountain so there is rarely a flat surface for any extended stretch of the road. The other big thing to point out – I just got over fear of painting snow in the last little while. It was this mental block. How do you paint a colour that isn’t there? No idea. My solution has been an exercise in fun and I can continue to tweak colours on it later, which I likely will. But it’s to start with a wash of water and then to drop in purple and blue around the edges where I feel the weight of the snow would fall. So that’s it for now! Hope you enjoy it. This entry was posted on Sunday, January 22nd, 2017 at 11:07 am. It is filed under General Musings, Travel Kit and tagged with travel sketches, urban sketching, winter sketching. You can follow any responses to this entry through the RSS 2.0 feed.